Julian set off to Gaul with a guard of 300 men and without any idea of military matters. The plan was simply to give an air of concern to a neglected theatre. The Alemanni were well established and imperial forces were disorganised. The actual running of the campaign was in the hands of Sallust, an experienced general. Sallust and Julian, despite coming from totally different backgrounds, hit it off personally. Throughout his life Julian was to show himself capable of charming people, but this particular friendship was to be crucial because it got Julian into an active role in the army. I have a feeling that this was the exact opposite of what Constantius intended, and there must have been plenty of subtle barriers erected to prevent it happening. But Julian set about becoming a soldier. He didn’t find it easy. He was heard to sigh ‘Plato, Plato, what a job for a philosopher’ during strenuous exercises. Spending the winter in Vienne he must have learned just how dismal the situation in Gaul was. Autun was under siege. The Alemanni were spread across the countryside raiding at will. They were only being resisted at Autun. And this was only because some veterans had taken up their arms again and were holding out in the city with difficulty because the walls were in a poor state of repair. Julian marched to its relief and raised the siege. From there he marched to Rheims where such forces as were available had been ordered to gather. The low spirits of the men were lifted by the presence of the young Caesar. With a small force he set out. perhaps with more courage than wisdom, to seek combat with the enemy. The Alemanni were in a strong position. They occupied a position that roughly corresponded to Alsace Lorraine. They had fortified this area by makeshift fortresses made from fallen trees. They were to the West of the Rhine and there were no natural barriers to hinder them from raiding across the rest of Gaul. And they had done exactly that with 45 towns being devastated. They also blocked communication between the Rhine and Danube legions. Julian’s attempt at an aggressive approach was courageous and decisive, but on the face of it not particularly wise. His small force was attacked by a much larger force with the loss of two whole legions. Julian counter attacked shortly afterwards and claimed a technical victory. This was probably important for morale, but he didn’t have the strength to follow it up. He was not off to a great start but he did manage to advance to the Rhine and survey the ruins of Cologne. This was a long way north of the Alemanni incursion and I am not at all sure what he was trying to achieve by this. As winter came on he retreated to Sens to plan his next move and to reflect on what he had learned. There he was besieged by a large force of the Alemanni. He was holed up for 30 days but succeeded in fighting off his attackers. He can’t have been particularly happy with his own performance in the campaign so far. But he was a quick learner and studied hard to learn the lessons to be drawn from his experience. But he was furious with Marcellus, the Master General of the Horse and the senior commander in the area. He had made no attempt to relieve the Caesar when he was at risk of being overrun in his camp. This smacked of treachery. Julian complained to Constantius, who replaced him with a more compliant commander called Severus. With the replacement of Marcellus the whole approach became a lot more serious, on paper at any rate. A very sound plan was put together for the next season’s campaign. Julian was to advance into the area occupied by the Alemanni from the West, fortify and hold Saverne. Meanwhile a general called Barbatio would advance from Italy with a strong force of 30,000 and attack the Alemanni from the South. Under threat from West and South they would be forced to withdraw across the Rhine. It ought to have worked. But Barbatio did not seem to inspire much fear in the Alemanni. On one occasion a large group of barbarians was allowed to get past his camp unimpeded. He also destroyed boats and supplies that Julian badly needed. And worst of all, the Alemanni felt confident enough that they could concentrate all their strength on attacking Julian. When he realised the situation, Julian advanced to meet them. He had some 13,000 men and he faced at least 35,000. The Alemanni were led by a chieftan called Chnodomar, a man well known to Constantius. They had been allies in the fight against Magnentius. The armies met at Strassbourg. The battle started late in the day, with his men urging Julian to fight straight away and not to rest for the night as he had wanted to do. Julian commanded the cavalry on the right and was horrified when they broke and started to flee the field. Julian personally intercepted them and persuaded them to return to the fight. This swung the battle the Roman’s way and incredibly, the Romans won. Chnodomar was sent as a prize to Constantius. This victory transformed the image of Julian. He now had a track record to point to. From now on he would be taken seriously and could start to push his own ideas with more conviction. He showed his growing confidence by meting out some old style military discipline. The cavalrymen who had so nearly let the side down were punished by having to parade around the camp in women’s clothing. Firm, but fair. The Franks had done much the same as the Alemanni in Belgium, and were occupying a large chunk of the empire. Straight from Strassbourg, Julian moved against them laying siege to a fortress on an island occupied by 600 Franks. He won, but they put up a ferocious resistance before surrendering. Surrending up until then hadn’t really been something Franks did. Their philosophy had been conquer or die. Julian sent the prisoners off to Constantius who put them into his guard. But the difficulty Julian had in subdueing this relatively small group of Franks showed him the danger of letting them gather in large numbers. So without giving his men or the enemy time to breath he engaged in an early form of blitzkrieg and rapidly overran the Frankish enclave. He used to good advantage the superior training and discipline of his soldiers and also the age old Roman custom of divide and rule, offering good terms to anyone who surrendered early. Julian consciously modelled his approach in Gaul on that of the original Caesar, i.e, Julius Caesar, and sent back reports of his exploits. He must have read the Gallic Wars with great interest. Who wouldn’t if they were in the same position. It might even have been Caesar’s example that inspired his next strategic move. He advanced across the Rhine into Germany itself. Once there he set about destroying villages, destroying or comandeering supplies and recovering Roman prisoners. He was in a position to dictate terms and was soon organising the frontier in ways that suited the empire’s needs. In particular he made sure that the Rhine was freely navigable for Romans. Constantius had negotiated this already in return for a payment of 20,000 pounds of silver. 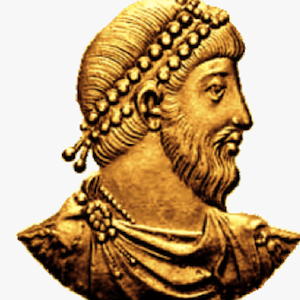 Julian tried to get this paid to his troops instead, but Constantius refused. Julian’s popularity with his troops was already a threat and he wasn’t about to help him with this. In fact pay for the soldiers was blocked. This was not a shrewd move on the part of Constantius because it only made the legions all the more likely to rebel. On at least one occasion Julian had to refuse his troops attempt to declare him Augustus. Meanwhile Julian having shown himself to be a highly effective military leader who had won over the men to his side, proceeded to give every sign of a great civil leader in the making as well. In his settlements with the Germans he extracted supplies and materials necessary for a large rebuilding programme. He started straight away building fortresses and repairing towns in the border region to block further barbarian inroads. He had 600 barques built in the Ardennes which set out to Britain and returned loaded with grain supplies badly needed in the areas where crops had been disrupted by the fighting. None of this had been part of the plan hatched by Eusebia and Constatius. As Julian knew very well, he had been sent to add a lustre of imperial prestige to the military operations in the area. He wasn’t supposed to actually take over command of the forces. He also wasn’t supposed to be an actual head of the civil government either, but in that relief and rebuilding programme we see a clear aspiration to be a proper ruler. Constantine’s constitution had established a very clear distinction between civil and military administration. Even with the army behind him Julian had no particularly effective constitutional role other than as a final arbiter of disputes that couldn’t be settled in the courts. As soon as he had dealt with the barbarians Julian was in Paris taking a lot of interest in the way Gaul was run. He showed himself to have a lenient streak when it came to justice. In one case he pardoned a local official accused of tax evasion. The exasperated prosecutor asked how anyone could be convicted if it was simply a matter of asserting innocence. To which Julian replied that how could anyone avoid conviction if it was simply a matter of affirming guilt. But as we all know the serious business of government is taxing and spending. This was in the hands of the Praetorian Prefect Florentius. Florentius was charged with extracting cash from his province and passing it on to the central government in the person of Constantius. Florentius was a courtier and was mainly concerned with extracting the maximum amount of cash out of his province for the emperor. This was what enhanced his status in the administration. Julian was a lot more concerned with the well being of the subjects and the long term health of the economy. He liked the Gauls. Admittedly they drank a lot, which was contrary to the austere principles of Julian himself. But to set against that they were honest, hard working and knew how to fight. Julian had raised local levies to bulk up his forces and these were to prove to be his most loyal troops. Julian’s removal of the barbarian threat and his rebuilding programme stimulated the economy of the region. The influx of resources from across the border was helpful too. Stimulus programmes have a mixed press overall but in straight economic terms you can’t beat one that is funded by someone else. The effects didn’t take long to show. This meant that potentially there were more taxes to be had. But as any reading of history shows, excessive taxes tend to reduce economic activity. Julian who seems to have been motivated by genuine concern for the citizens, opposed the imposition of a new tax which would have made everyone poorer. This was a courageous act on his part. Complaining about the appointment of a general was bad enough. Arguing to deprive the court of hard cash was a much tougher and potentially much more dangerous course of action. A letter from Julian to a friend on the matter has survived and it shows Julian well aware that he was putting his neck on the line, and claiming that his motivation was simply that he felt it was his duty to stand up for what he believed in. It is hard to see any other motivation so we must take him at his word. He succeeded in blocking the tax and the Gauls continued to prosper. Julian set himself up in Paris, then a fairly small and a fairly new settlement. This is the first time this city enters the history of Europe. Julian had achieved a huge amount in a short period of time. It is hard to think of another figure in Roman history whose career got off to such a great start. But before we investigate what he did next, we need to get back to the history of the progress of the Church.